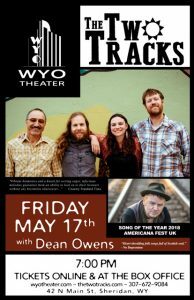 The Two Tracks return to the WYO Theater bringing along their treasure trove of heart-felt songs. Based right here in Sheridan, Wyoming, they’ve toured coast to coast on the success of their Postcard Town album, released in 2017, and produced by Will Kimbrough at the Grammy winning Butcher Shoppe Studio in Nashville. Their harmony-rich music often features cello, creating a unique ambiance that’s all their own. The Two Tracks will be joined by Dean Owens, one of Scotland’s finest singer/songwriters, who recently won Song of the Year from the UK Americana Music Association. Armed with a searingly soulful voice, skillfully crafted stories and memorably heart-twisting melodies, he is a compelling and engaging live performer. In his early career Dean was the front-man of the much loved Scottish Americana Band The Felsons. His music has taken him far and wide, including Europe, the US, and Aulstralia. He has played shows and toured with the Mavericks, Steve Earle, and Emmylou Harris, just to name a few. Advance tickets: Adult $20 ♦ Senior & Military $15 ♦ Student $10.